BOOK of MORMON RESOURCES: How Many were Many and Few? The article "Test #6 Relative Distances" explains why we need to understand the Nephite meaning of our English word "many." I am patiently working through John L. Sorenson's foundational series of Book of Mormon geography works (An Ancient American Setting for the Book of Mormon 1985 415 pages, The Geography of Book of Mormon Events: A Source Book 1992 revised edition 415 pages, Mormon's Map 2000 158 pages, and Mormon's Codex 2013 826 pages), appreciating his prodigious effort while documenting his myriad inconsistencies. 2 Nephi 5:7 says Nephi and his followers traveled many days in the wilderness to get from the coastal land of first inheritance to the city of Nephi. How far would that have been? One day's travel in Nephite parlance was probably about 15 air kilometers. See the article "Land Southward Travel Times" referenced frequently in this blog. But, how many were many days? Contemporary English speakers would not call 2 days "many." What about 3, 4, or 5 days? The problem for Book of Mormon interpretation is on the low end of the range. It is clear from the text that on the high end "many" can refer to dozens 1 Nephi 13:1, hundreds 3 Nephi 7:4, thousands Ether 10:17, tens of thousands Helaman 3:5, or even millions Mosiah 14:12. Helaman 6:32 tells us that a little over 1 year (67th year of the reign of the judges) was considered not many years. Helaman 11:26 tells us that 2 years (79th and 80th years of the reign of the judges) were considered not many years. Helaman 4:26 tells us that 3 years (57th through 59th years of the reign of the judges) were considered not many years. Helaman 7:6 tells us that 3 years (67th through 69th years of the reign of the judges) were considered not many years. Helaman 14:21, 26 coupled with 3 Nephi 8:19 tell us that at least 3 and likely a little more were considered many hours. Words of Mormon 1:2 tells us that approximately 3.8 were considered many hundred years. Helaman 8:18 tells us that approximately 4 were considered a great many thousand years from Adam until Jesus Christ. This curious phrase "a great many thousand" also shows up in 3 Nephi 3:24 where it refers to tens if not hundreds of thousands of people. Helaman 1:3-4 tells us that 4 or more were considered many sons. Jacob 4:4 and Jacob 7:7 tell us that approximately 5.4 were considered many hundred years. Alma 51:26 tells us that 6 were considered many cities. (Note: this verse is one of the few known scribal errors in the text. 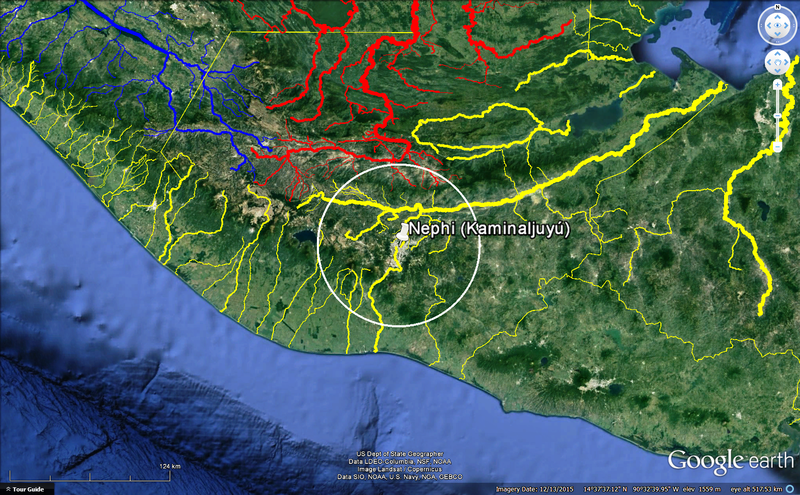 Inland "Nephihah" should be coastal "Moroni." See Alma 51:25. Alma 16:11 coupled with Alma 49:2-3 tell us that 7-9 were considered many years. 1 Nephi 17:4 tells us that 8 were considered many years. Mosiah 10:3 tells us that 22 were considered many years. Mosiah 7:4 tells us that 40 were considered many days. These remarkably consistent data show that 3 or less of something would generally not have been considered "many" while 4 or more of something could definitely have been called "many" in Nephite usage. So "many days" travel was 4 or more days travel which equates to a minimum of about 60 air kilometers. 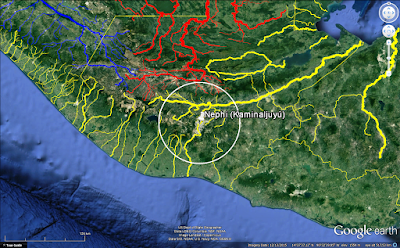 So, to answer the initial question, we would expect the land of first inheritance to be at least 60 air kilometers distant from the city of Nephi (Kaminaljuyú is the most widely-proposed candidate). This means any place along the Pacific coast of Chiapas, Guatemala, or El Salvador likely fits the "many days" criteria. When Alma2 left Ammonihah traveling toward Aaron, his guardian angel intercepted him and told him to rejoice and return to the apostate city Alma 8:16,17. Alma began fasting (rejoicing D&C 59:13,14), turned around, and traveled back to Ammonihah. His return trip took "many days" Alma 8:26, Alma 10:7. This means that Ammonihah and Aaron are probably more than 60 air kilometers distant from each other. This means the Sorenson correlation probably locates these two cities too close together to comfortably fit the text. "Many" contrasts with "few" in Alma 26:31. How many were few? 3 Nephi 6:3-4, 9-10, and 16 tell us that 3 were considered a few years. Zeezrom asked Amulek 8 questions Alma 11:21-38 which he considered a few questions Alma 11:21. 3 Nephi 8:19 tells us that 8 plus a few others such as Mary Whitmer were considered a few witnesses of the plates Moroni delivered to the Prophet Joseph Smith. Mosiah 20:5 tells us that 24 were considered few Lamanite daughters. A stock phrase in the Book of Mormon is "many waters" referring generally to the ocean 1 Nephi 13:10-13, 1 Nephi 17:5, Ether 2:6. The land of Ramah/Cumorah which was among many waters Mosiah 8:8 could be partially surrounded by ocean or the phrase "many waters" could also have meant inland bodies of water which is the likely sense of Mormon 6:4. Either way, our candidate for Ramah/Cumorah fits the text. The Tuxtlas jut into the ocean so they are "among many waters." 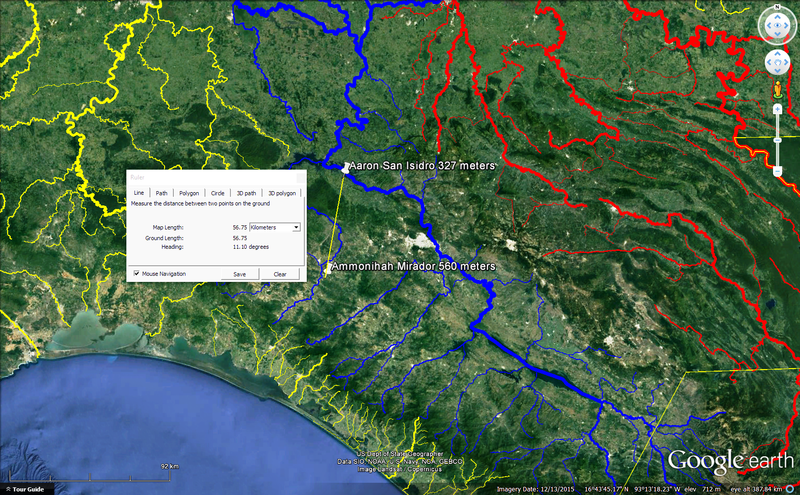 The green icons (from INEGI) on the map above represent surface water which is relatively abundant in the rainy Tuxtlas. This region certainly qualifies as a "land of many (surface) waters" or a "land of the ocean."